Snack attacks are a real thing. And they are NO thing to underestimate. Seriously! If you've ever experienced that sudden, unwavering need for something to munch on while you're working or find yourself so hangry in between meals you can't even think, you definitely understand where I'm coming from. The problems I've found with snacking though is 1) portion control and 2) snacking on the right things that will keep me full. Usually, the last problem was because I would almost always use carbs like fruit as my snack attack go-to & fruit isn't something that is going to tide you over until your next meal. While I'm still on my health & wellness journey, I do think I've finally figured out this whole snacking thing. What I've realized is that the absolute key to snacking is to stick to smaller portions with higher amounts of healthy fats. I'm sure if you read my blog or keep up with my Instagram, you've heard me talk about the importance and role healthy fats play in your diet, but if you haven't, let me just reiterate a bit! When healthy fats enter your body, they get digested at a much slower rate, which in turn increases fullness and decreases your appetite. 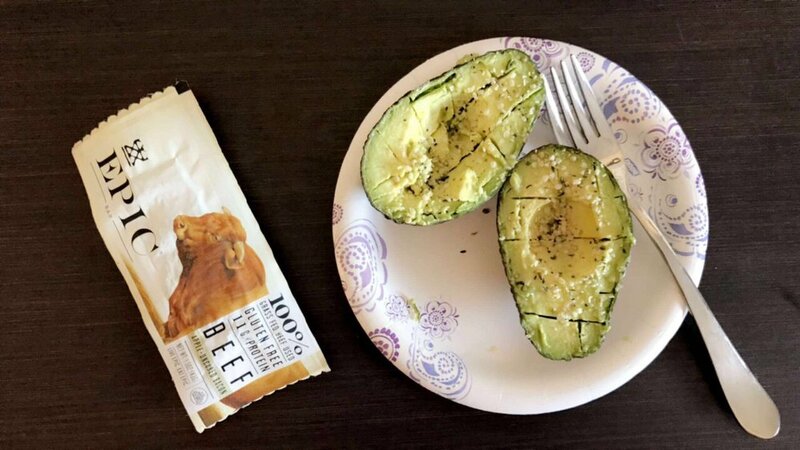 So, it makes sense to incorporate good healthy fats into your next snack to ensure you feel satisfied & don't end up raiding the entire fridge before you've even had dinner. Anyone else been there? Lol. 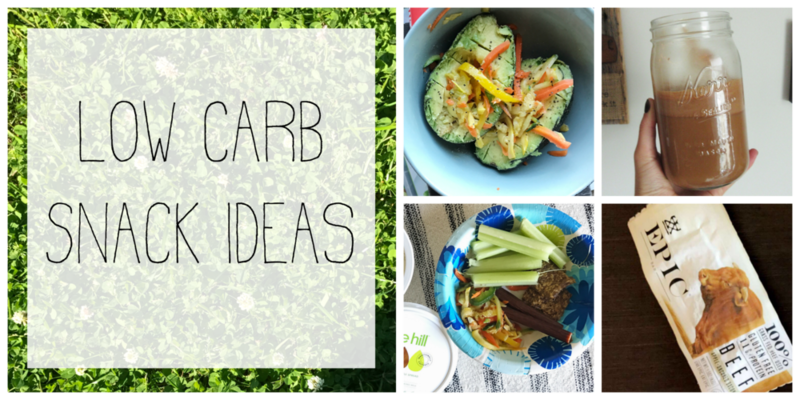 If you're looking for some low-carb, higher fat snack ideas, just keep reading below! If you eat meat, jerky is such a great option! Since meat is high in protein as well as fat, satiety won't be something to worry about after eating it. Make sure if you're snacking on store-bought jerky to be careful about which type you're buying. Always buy grass-fed or uncured meat. Always check the ingredients section, as some companies like to sneak unnecessary sugar in their product which is no bueno. My personal favorite brand is Epic. Go check out their site because they have so many other products rather than just jerky AND they're mostly all gluten free. I think nowadays with all the social media, the incredibly talented food bloggers, & the mouth-watering photos of yummy food slathered all over our Instagram feeds, we forget about simplicity when it comes to meals and snacks. Now trust me, I get a lot of my meal inspiration from Instagram/food bloggers, but I'm not eating these intricate, beautifully presented meals for breakfast, lunch, and dinner every day. I may eat a really lovely breakfast, but then have an avocado & veggies for lunch. If you get too caught up in the complexity of your meals, you're going to start losing the nutrients that come with simple whole foods. One of my favorite snacks is the simplest & quickest thing to whip up (which is part of the reason it's my favorite): a veggie plate! Since I live in a dorm, I buy pre-cooked veggie medley's from the whole foods store near me. My snack plate will usually consist of bell peppers, celery, flax-seed crackers (try flackers crackers, so yummy & crunchy), and jerky! But the wonderful thing about a snack plate is that you can totally cater it to you and the veggie's you love! Now a snack plate isn't anything without something to dip the veggie's in though. You can make some homemade guacamole or even use a cheese dip! 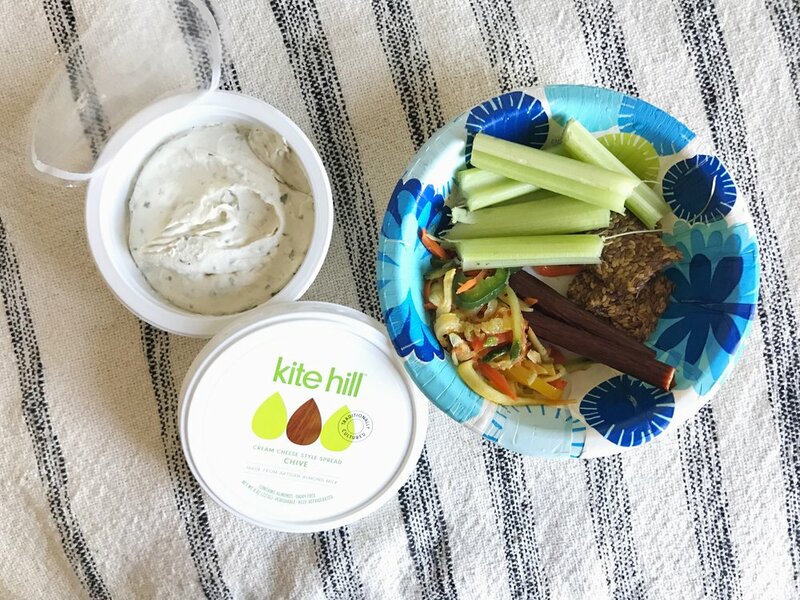 If you eat a dairy free diet, try kite-hill's almond milk "cream cheese". It is TOO DIE FOR. So for some reason, this has been my favorite go-to recently. I've been doing this smoothie/drink aside a small lunch, as a snack, or as a lunch by itself, so it really just depends on however much of it you make! Basically there's two main ingredients you need to achieve this snack: coconut milk + cacao powder. Once you have those, you can really add in whatever else you want! 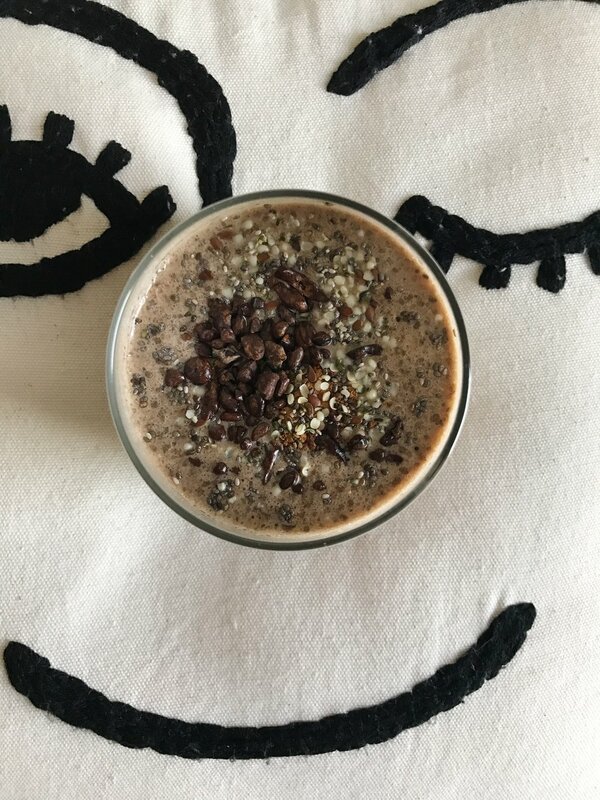 My favorite way to make this snack is to combine full fat coconut milk, cacao powder, cinnamon, chia seeds, collagen peptide protein, & some salt. You can even add in some almond butter to give it a creamier texture! What's fun about this idea is that you can make it either a cold smoothie or a hot beverage that's sort of like a hot chocolate. I love enjoying this as a hot beverage, so after I add my ingredients into the blender, I pour in however much hot water I want & blend it all up! Going back to what I said about simplicity, I love to keep things real simple with a good ole' avocado. Avocado's are my favorite because they just give you that creamy consistency, almost like a spread or a sauce, when you're lacking it in a meal. 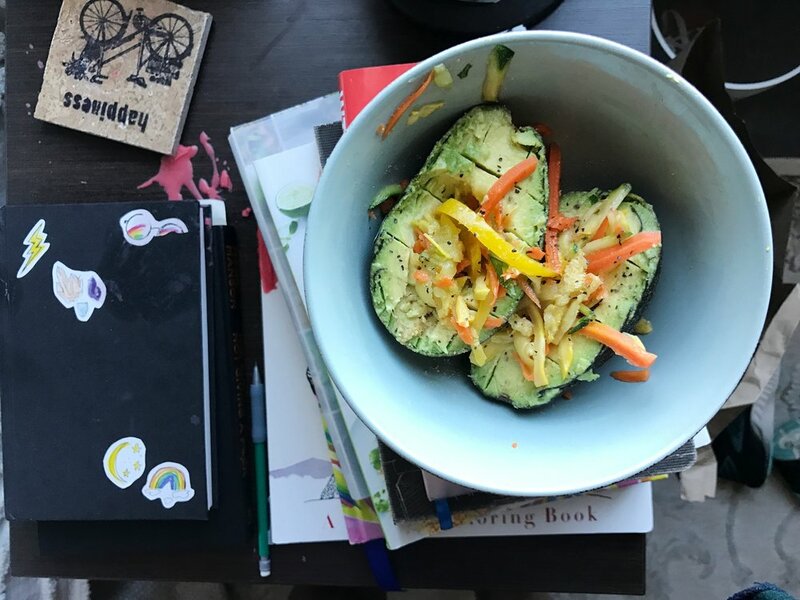 Although I do enjoy avocados in meals, they tend to be more of a go-to snack for me because they're quick and easy to prepare. All I do is sprinkle on top some himalayan pink salt, black pepper, & if I want more crunch, I'll throw on some hemp hearts! You can also eat it with some shredded veggies on top. I've realized whenever people "snack" on avocados or even put them in their meals they only eat half because avocados are pretty high in calories. But I honestly eat one whole avocado a day, lol. And I don't eat half for one meal and save the rest for a later meal, I eat it all at one time! Maybe this is because I don't ever really eat "big" lunches and I always "snack" around lunch time. I don't know. I don't think it really matters whether you choose to eat half or the whole thing as long as you're listening to your body. If you want the whole avocado, eat the whole avocado, lol. Lastly, but certainly not least, chia seed pudding! This is a great option if you're craving something like oatmeal or yogurt & granola and are dairy-free or low carb. I actually created a blog post on my chia seed pudding recipe, so if you want that click here! But honestly, whenever I'm craving a dessert-like snack or something that reminds me of oatmeal, this is always my go-to and it always satisfies those cravings. There's also a ton of different things you can add to it to make it your own, so don't be afraid to experiment a bit with what you have around the kitchen! My favorite toppings to add onto chia seed pudding are things like cacao nibs, shredded coconut, nut butter, & cinnamon!